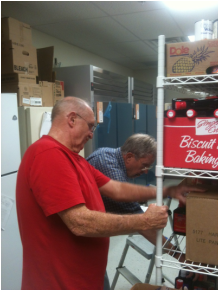 Food Pantry volunteers work to stock shelves in food storage room. Information and Referral Agency Referrals - Commonly known as I & R, the Information & Referral Agency located on the third floor of the downtown Cabell County Public Library, serves as a screening agency for our regular participants in the Food Pantry. They provide families and individuals with a voucher which they bring to us. 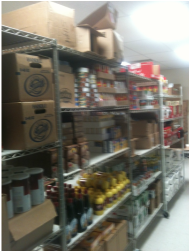 Emergency Assistance - Families within our church who are in need are provided food at their request. Families outside our church are provided assistance the first time and then they are advised to visit I & R for a voucher so that they may receive a full order of food. USDA Donated Foods Assistance - USDA Donated Foods (Commodities) are provided to any person who expresses their need for food. This is a new guideline issued through The Emergency Food Assistance Program and the United States Department of Agriculture based on the "self declaration" clause - meaning you take their word for it. The purpose of this new guideline is to prevent those who are homeless or unemployed from going hungry.